The negative impact of trauma lives in the body. While many clinicians have long suspected this may be true, understanding precisely how trauma affects the body has largely been a mystery—until Dr. Burke Harris pulled together both observation and data to show that early childhood experiences indeed do have an adverse effect on long-term health. 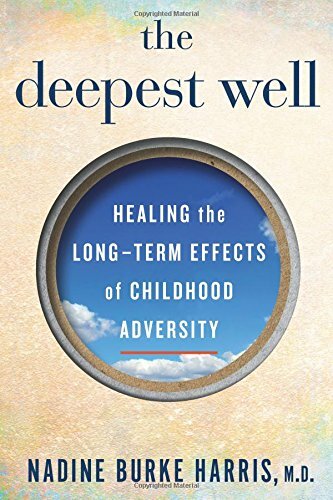 The Deepest Well describes what has been learned about “adverse childhood experiences” and the ways in which they can cause lifelong health issues. Adverse childhood experiences, called ACEs, are defined as experiences had before the age of 18 that fall into ten categories. These adverse experiences include: recurrent emotional or physical abuse, sexual abuse, physical or emotional neglect, a household with substance abuse, criminal activity or mental illness present, a parent (usually mother) treated violently, and divorce or separation. While many if not most children will experience one or more of these problems while growing up, the more adverse experiences a child has, the more likely s/he is to develop physical problems later in life. What might be most interesting about the main study on which Dr. Burke Harris bases her conclusions is that it was not conducted with an economically disadvantaged, minority population. “The original ACE Study was done in a population that was 70% Caucasian and 70% college educated.” The study participants were people with access to quality healthcare. This demographic data underscores that it is the adverse childhood experiences themselves that are the risk factor for many common and pervasive illnesses in the U.S., not race, income, or lack of access to care. The data indicates clearly that to treat some of the most insidious and widespread medical problems facing the nation, we have to be willing to think in unconventional ways. The kind of radical change in medical thought processes that Dr. Burke Harris calls for could be genuinely transformative and lay the groundwork for revolutionary ways of thinking about and treating illness. While accurate, this is far easier said than done. At present, there is little if any political or cultural will to make the changes Dr. Burke Harris suggests are needed. What are some of the solutions to the ACE problem? Children need access to integrated mental health services early in life. This care should be given at every socioeconomic level, from state-funded medical clinics to private clinics for those with top-tier insurance. Programs and educational opportunities that provide community support to children and their parents would diminish negative experiences. Anti-poverty initiatives that bring resources to families in underserved and sometimes ignored communities in this nation’s cities and rural areas would also solve much of the problem. Additionally, physicians need a different type of training to identify children who have experienced early trauma. They need to learn how to ask different questions and put families in contact with support services. Physicians, not social workers, can and should be on the front line of identifying children exposed to ACEs and be involved with providing the services that will improve their patients’ ability to respond to medical care. The only disappointing aspect of this book is that for those who have been significantly influenced by ACEs who are now in their 30s, 40s, and 50s, the book leaves the reader wondering what can be done—not just for the children who need help today, but for the adults who suffer from illnesses traceable at least in part to childhood trauma. The Deepest Well: Healing the Long-Term Effects of Childhood Adversity by Dr. Nadine Burke Harris is a necessary read for anyone who works with or loves children, particularly those who might be in the foster care system or struggling with adversity. If Dr. Burke Harris has anything to say about it, there is a medical revolution on the horizon and children will be its beneficiaries.